I think out of the two WB I'd prefer Nuclear. Fracking is costly and who knows about the possibly risks. We could even get a major earthquake. So better to build safe Nuclear power stations alongside windmills etc. However they are going to go ahead with fracking as these none lib do-gooders couldn't care less about the enviroment or the cost to peoples health. It's important that any effects that a dip in the activity of the Sun might have on the European climate do not detract from the importance of reducing our carbon emissions. It may well be that we got through a period of colder winters, but then what happens when the Sun picks up again? Fracking is a disaster waiting to happen. More research needs to be carried out before it could take place on a large scale. I've nothing against nuclear power so long as it's done safely and the waste is dealt with in a good manner. Fair point EB.... although I dont totally agree with some of the propoganda put about to justify sky high fuel bills by some working on 'research grants' paid for by Iinterested parties. A balanced power stratedgy and affordable bills please. When there was no rain it was global warming. Water companies jacked there bills in glee and put meters in. Now there's too much rain, its global warming and the water companies will put their bills up in glee again. They'll even have a map from New scientist to prove it.... it even comes with a global warming guide link. Win, win - Keep the utility companies share holders happy and the do gooding eco fascists happy... jack those bills up and tax, tax, tax whilst young people have to live at home until they are 50. Build more houses on those flood plains to house our new highly skilled workforce that pushes our population up even further and apparently doesn't impact on resources? Sadly those in the shires don't want windmills and nuclear power stations, but look perplexed as the tide of change finally leaves the inner cities and starts to impact on their lives in many ways. Actually.... if its so warm why aren't our gas and electricity bills coming down. The wholesale graph for energy suggests less use and more capacity this winter due to it being mild? Nice graph..... As for the poor people who are being flooded.... they deserve better from our useless politicians..... but then...... everyone has a vote? facts are facts Warley. Many people are suffering this winter because of the ignoring of climate change. It must be the wettest winter of all time - Whether you think its man- made or not to ignore it, like this govt have done and to invest so much money in the Hs2 project and so little in protecting areas at risk from floods is plain wrong. Why mention HS2 ... why not mention millions wasted elsewhere? Millions sent abroad? Wars? Pomp and ceremony? At least HS2 adds to our infrastructure and may provide a few jobs? We haven't spent the money yet. Trains are eco friendly (although not my fault Beeching closed them all down in the 60's). Whatever the facts..... money is being made for companies on the back of utility bills. People have houses on the flood plains because its often beautiful and we are an over crowded island. Build those windmills and nuclear power stations now. If we want a bigger population, then we need to pay the price and consider building in the green belt rather than the flood planes. Personally I want neither. I'm afraid we are all in denial and want to pretend we all can escape the consequences of being a Nimby. I could also suggest that the shires are finally starting to understand what impact rapid population growth has on our country. The answer to all this mustn't be to squeeze people and make them feel poorer! I don't know Warley, I just think it was pretty obvious that type of floods were going to happen so more should have been done for prevention. Its not like the benefit of hindsight here! Any idiot could have predicted this! Agree.... But I'm afraid building houses in certain areas isn't a good idea what ever your views on global warming. The south east and the cities are now terribly crowded. Why should we pay for flood defences for houses (mostly but not always) built to cater for this? Indeed why should we pay for flood defences so that people can have a beautiful view of the river? Another inconvenient truth... Another cost of rapid population growth. However, I could say that this country spends billions abroad... and perhaps some of that could be more better used? So many problems.... Not many ideas from the politicians.... Apart from tax, tax, tax and protect the divi :mad: those poor people need help... They have been neglected - but to keep building in this way is not a solution IMHO. (11-02-2014, 07:50 PM)Warleybear Wrote: Agree.... But I'm afraid building houses in certain areas isn't a good idea what ever your views on global warming. The south east and the cities are now terribly crowded. Why should we pay for flood defences for houses (mostly but not always) built to cater for this? Indeed why should we pay for flood defences so that people can have a beautiful view of the river? Another inconvenient truth... Another cost of rapid population growth. However, I could say that this country spends billions abroad... and perhaps some of that could be more better used? So many problems.... Not many ideas from the politicians.... Apart from tax, tax, tax and protect the divi :mad: those poor people need help... They have been neglected - but to keep building in this way is not a solution IMHO. Yes some of these people are just renting the properties but yes I do agree to an extent. Nice to know our leaders have their priorities in order - Â£25 billion on planes, Â£30 billion (or a lot more) to save 15 minutes on a train journey and millions sent to countries that have their own space programme - much better than spending on defences against flooding. Yes.... But apparently if we put on our loin cloths and turned off the electricity life would be a lot nicer. We are an over crowded nation in an over crowded world. Entry level jobs for young people gone. Resources being drained. Cheap rate jobs being subsidised by in work benefits such as housing benefits. Restrict the size of the population.... Control immigration, pay child benefit on the first two children. Perhaps Logan's run for those over 65? Cars have to be scrapped at 5 years old? Get rid of the council tax and charge people a Â£1000 tax for every car they own? Bring back the poll tax so individuals are charged rather than the property? Remove council tax benefit for any house over Â£100 per week? Renationalise gas and electricity? ..... Build a few nuclear power stations? Billions spent on foreign aid which never gets to where it should.Â£30 million found to help the South West of our country and then....panic! The Thames overflows and suddenly resources appear from everywhere.Strange eh! As an aside,I haven't seen any aid coming from anywhere to help us.Just a thought! No its really bad. 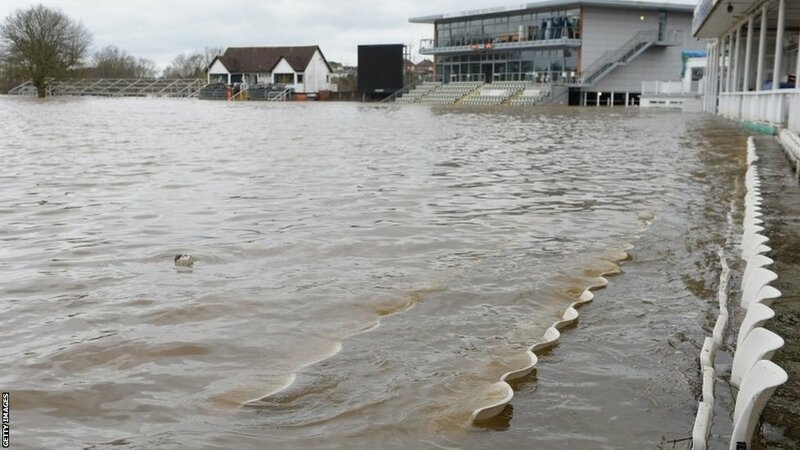 You can hardly see the cricket ground or the racecourse for water and that bridge has been closed off for a few days. Its worse than 2007 isn't it? More heavy rain forecast tomorrow so can only get worse. Obviously more important things than cricket but you have to wonder whether the ground will be fit for purpose this coming season. In the modern era, with costs etc, you do have to ask if this is ultimately sustainable as a venue? With the likelihood of this sort of weather happening more frequently because of climate change then no. They have invested a lot of money in the ground as well but they'd be better off investing it in Kiddiminster or finding a new site in Worcester. They wouldn't be able to sell the ground for much anyway. They couldn't build houses on it! Was there global warming then I wonder? The tidal surge down the east coast in the 1950s was horrific. As the tide moved down the coast, no one thought to warn those further time the south. People drowned in their beds. Worcestershire.... a candidate for amalgamation when the championship is cut to 12? Gloucestershire or Warwickshire?